I’ve been thinking a lot about this quote, that I’ve pictured above, since I stumbled upon it a few weeks ago. 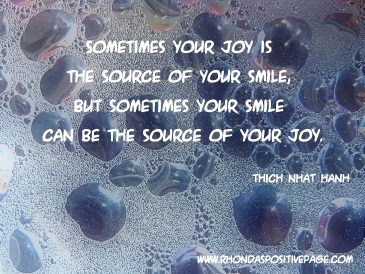 And it reminds me of one of Thay’s (Thich Nhat Hanh’s) teachings: there is no way to happiness, happiness is the way. It is easy to first use our intellect to try to absorb teachings and then as we continue to practice we can deepen our understanding in order for our hearts to become involved in the process. What does it mean to say, “There is no way to happiness, happiness is the way?” I encourage you to take a few minutes and see what comes up for you. And as Thay talked about a few times during the 21-day retreat this past June, produce not a notion but an insight. For me, when I think of there being no way to happiness, it means that happiness is available in the very here and now, that I don’t have to travel somewhere else to experience it. It means that I am the only condition that needs to exist in order for happiness to arise. And if I’m not happy in this moment it is because I am standing in my own way. Depending on the moment this can be difficult to admit. I can say, “sure, sure, I’m the only condition of happiness that is needed,” (using the intellect) and then when I am caught in anger or despair I can switch right back to blaming someone or something else for my situation. Saying “there is no way to happiness, happiness is the way” is taking control of our lives and our experiences and responses to it. It was only fairly recently, within the last 1-2 years, that I understood fully (with my heart) that happiness, like anything else, takes practice. If we tend to be stressed out a lot, angry, filled with sorrow, pessimistic… these states of being took practice. We don’t tend to be taught that we are in charge of our emotions, we are more trained that our emotions are something that happen TO us from an outside source. So when we think about practicing emotions this concept may be very strange. Everything takes practice and we become skilled at what we practice. Happiness takes practice. We need to do what brings us joy. We need to cultivate opportunities to practice happiness in our daily lives so that we become more engaged with life itself, connected to the conditions of happiness that are available in each moment and better able to deal with conflict and difficult emotions when they arise. This practice brings me joy – and it is simply one tool in my toolbox, it’s a big tool for sure but there are others as well. 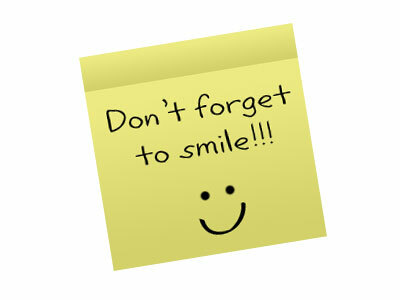 It’s important to keep in mind that no one tool can do it all, no one tool can build the whole house of our happiness. Some of my other tools are listening to, singing and playing music, being with friends, doing volunteer work, smiling, writing, working with kids, being in nature, hot springing, traveling, and dancing. If we only rely on one tool we will only be able to build part of our house. What are some of the tools in your happiness toolbox? What will you do today to practice happiness? Today, Sunday, I had a personal day of mindfulness. These can take any shape. My day of mindfulness started with some sitting meditation followed by eating breakfast and having a cup of tea. I allowed my eating to be the only thing I was doing, simply eating. I allowed my cup of tea to be the only thing I was doing, simply drinking my tea. It was difficult at first to enjoy my cup of tea without feeling like I should be doing something else as well like reading or walking around or going on the computer. And then one of my cats came to help me practice and climbed into my lap so that I could simply enjoy my tea and the purr of the cat. After my cup of tea I contemplated just what a day of mindfulness should consist of. Did it mean no work? Did it mean I couldn’t clean the house? These were of course my own questions, a day of mindfulness can really be whatever we want it to be. I decided that yes it meant no work, it meant I couldn’t clean the house. To me a day of mindfulness was a day to enjoy the day, reconnect with my practice and be fully present. I then went for a wonderfully beautiful walk outside in the rich autumn day. 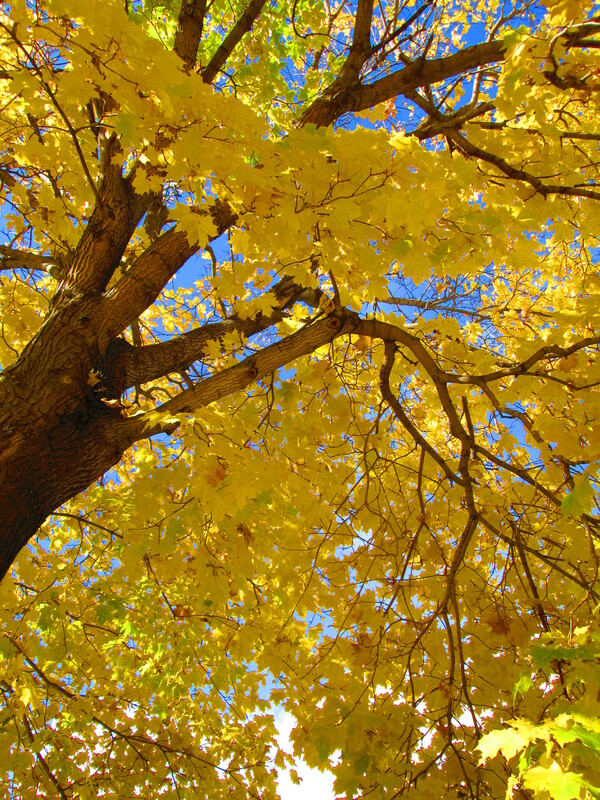 The sky was such a vibrant blue and it provided the most lovely backdrop for the fall trees in all of their diverse colors. My walk around the neighborhood was spent unintentionally in awe. I was captivated by every leaf. As I walked by the train tracks and made rock cairns I started to think about what constituted as beauty. Traditional beauty, like the sky, flowers, or a stream is easy to appreciate I thought. Whereas hidden beauty was everywhere but not easily seen. I didn’t have to walk to the park in order to see beauty, I could see beauty in the alley and the roofing company parking lot. Beauty is everywhere, waiting to be beheld. To say that A, B and C is beautiful but D, E and F are not beautiful is incorrect thinking. Everything is a part of life. Everything is from the earth. And everything is inherently beautiful. It might take some unraveling, but the beauty is there. 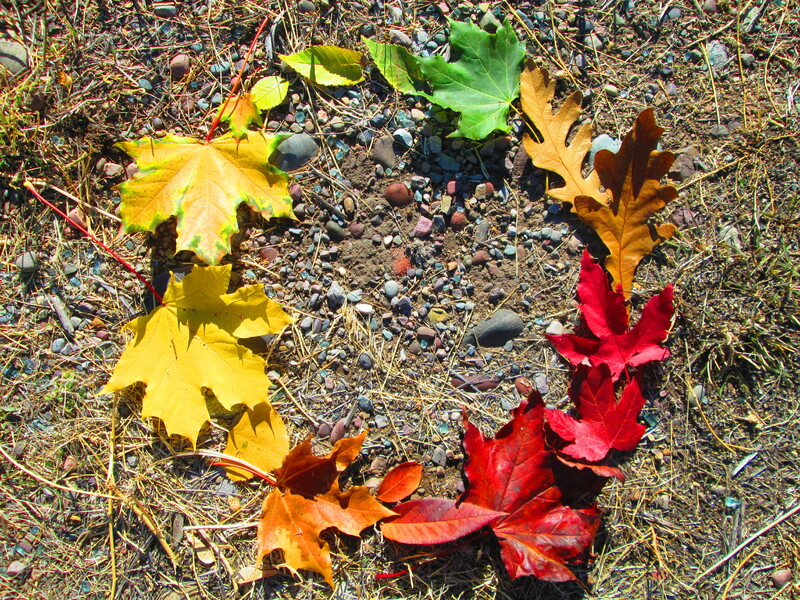 As I wove around the neighborhood collecting leaves and images of beauty I was truly present with my steps and my breath. I wasn’t caught up in my to-do list or my stream of thought. I was enjoying the day. And it was so wonderful to be free! When I got back home I put on some music and took a nap. And as soon as I lied down my other cat joined me :) Cats are very good practitioners. They already know how to let go and rest. I took a nap for over an hour and when I awoke I spent some time writing letters to friends and family that live in other states or overseas. Then I played some guitar and sang a new song I’ve been working on. Music waters my seeds of joy and I love playing, singing and listening to music. Afterwards I made some dinner and washed the dishes. As I washed each plate and glass I was aware of how much gratitude I had for having access to clean water. Whenever I go to the faucet clean water is there. Safe, clean water is a gift! I ate and enjoyed my food so much. I rounded out the day by listening to part of a dharma talk by Thay. (If you go to tnhaudio.org you can listen to many many talks archived there). It’s 6:30pm now and I wanted to type this up while it was fresh in my mind. I hope to start practicing a personal day of mindfulness at least once a month. It is easy to think that a day of mindfulness is not important work to do. To think that a day is better spent cleaning, and raking and getting things done. In fact, there is nothing more important than practicing to let go, enjoy and be. I was 28 years old when I joined the Order of Interbeing in 2007. I didn’t feel ready at the time to join the OI ranks of brown jackets and not much has changed for me in that regard, I still don’t feel qualified 5 years later, whatever qualified means. 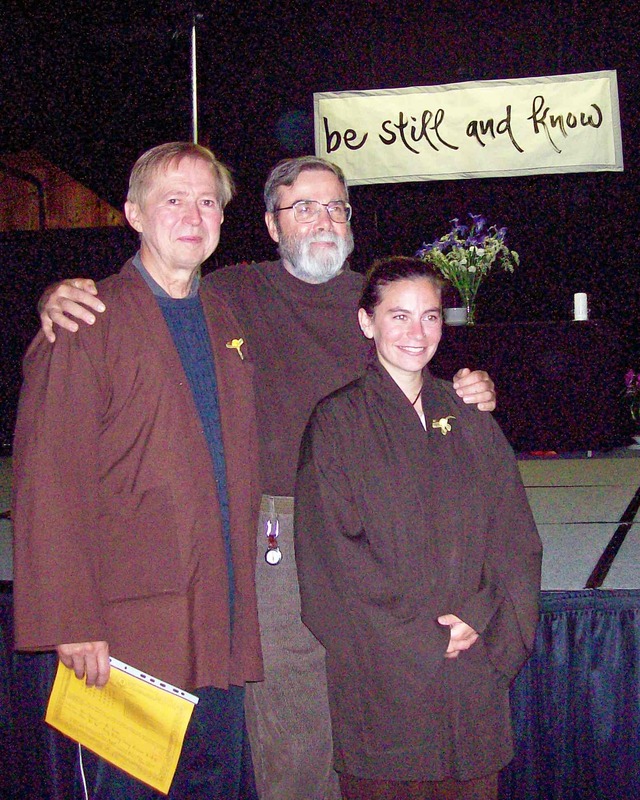 And on retreats I still struggle to wear the brown jacket, concerned it will set me apart from other sangha friends on the path. So why did I join the Order? Why am I on this path? Have you ever been walking in the woods and come to a fork in the trail and decided which way to go based on what simply felt like the right direction? It was like that for me. Sometimes the answer doesn’t have to be clear in order to take a step on the path. All I knew for sure is that I enjoyed the practice and wanted to be of service to others. And that really was enough. Becoming an OI member isn’t about having a perfect practice or mastering sutras and recitations, it isn’t about having knowledge that others don’t or gaining status and high rankings, it’s about seeing where our particular skill-set shines and offering that to others. You can’t build a house with only one tool just as you can’t build a community of practice with only one practitioner. For me, joining the Order at a younger age has been a wonderful practice in stepping up and saying, “Yes!” Yes, I can do this, yes I want to commit myself to this beautiful tradition, yes I have a lot to offer. To embrace ourselves fully just as we are with authenticity is of great value to to the world. When we embrace ourselves we embrace others. And when we embrace others we embrace ourselves. Being a part of the OI brotherhood and sisterhood is about embracing. Embracing the practice, ourselves and one another. 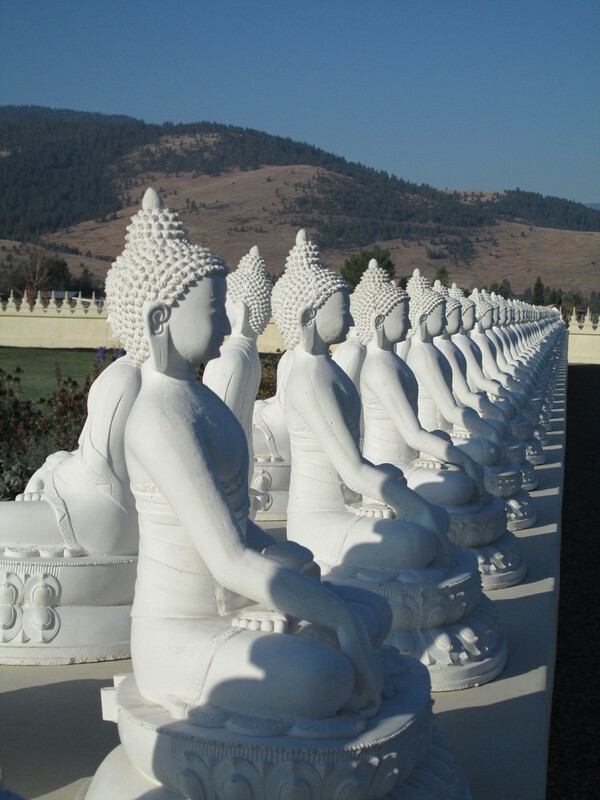 The Garden of One Thousand Buddhas in Arlee, MT is beautifully surrounded by mountain ranges and big skies – and many many buddha statues. I had the opportunity to visit the garden a few days ago in the morning, a time of day I’ve never experienced there before. It was about 25 degrees outside and the statues were thinly coated with a dusting of frost. 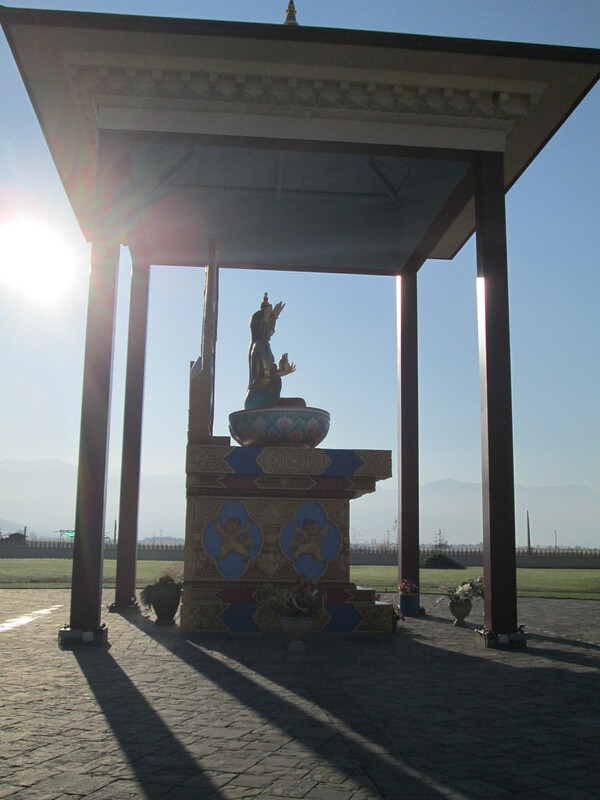 The garden is the unfolding vision of EWAM, practicing the teachings of the Nyingma School of Tibetan Buddhism (to learn more about EWAM and the garden go to http://www.ewam.org). According to their website: the purpose of the garden is to to bring about positive transformation within those who visit, in response to the negativity that abounds in the world today. What I most appreciate about the garden is the location. Traveling through the tribal lands of the Confederated Salish and Kootenai Tribes of the Flathead Indian Reservation you turn on White Coyote Road after passing through the small town of Alree. With a population of 636 and local store Hummingbird Toys & Treats, who’s sign tells passersby about their 57 varieties of black licorice, one would not expect that just a few short minutes down the road. past a few hay barns, horse corrals and farmsteads that a large, ornate and delicately painted statue of the Great Mother Yum Chenmo would rise from the fields. All one thousand buddha statues were hand-cast and are currently being placed on the 8 spokes of the dharma wheel surrounding Yum Chenmo. 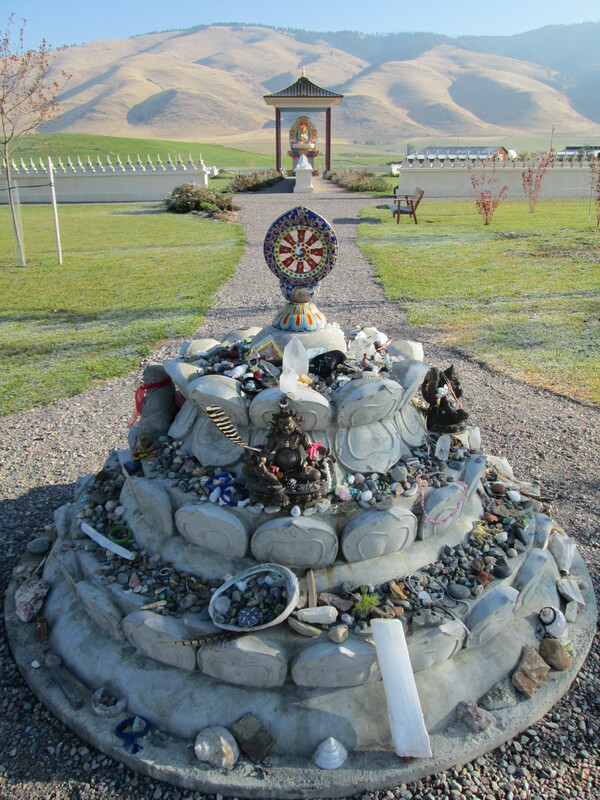 The wall lining the outer circle is topped with one thousand stupas, representations of the enlightened mind, each enshrining an image of the female deity,Tara. 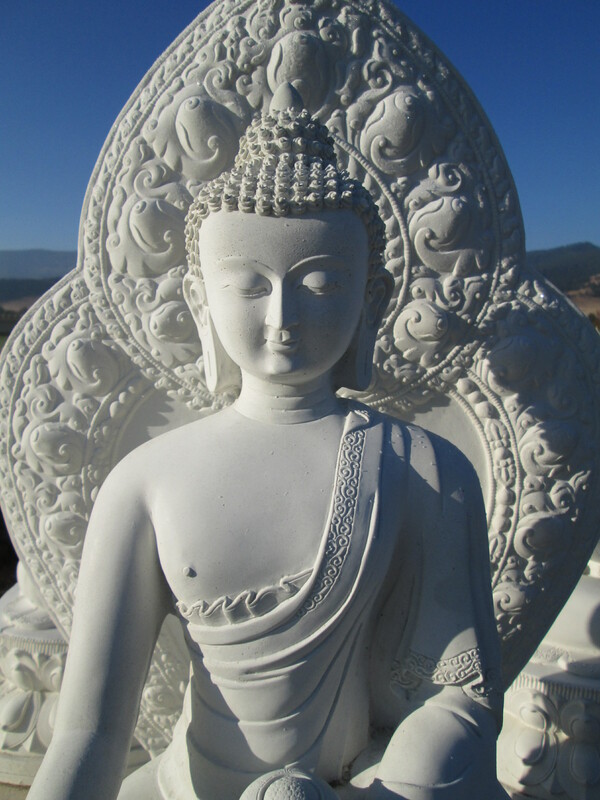 Coming from a Zen based tradition I have different practices than Tibetan teachings, so while I may not understand all of the various meanings of the garden I can connect on the level of peace and compassion that is being cultivated there. The garden has a lot of good medicine to offer. The other morning myself and some friends did some silent walking meditation around the garden. Each of us took our own path and mine led me to discovering how wonderfully the morning sun shone differently on each row of buddha statues. 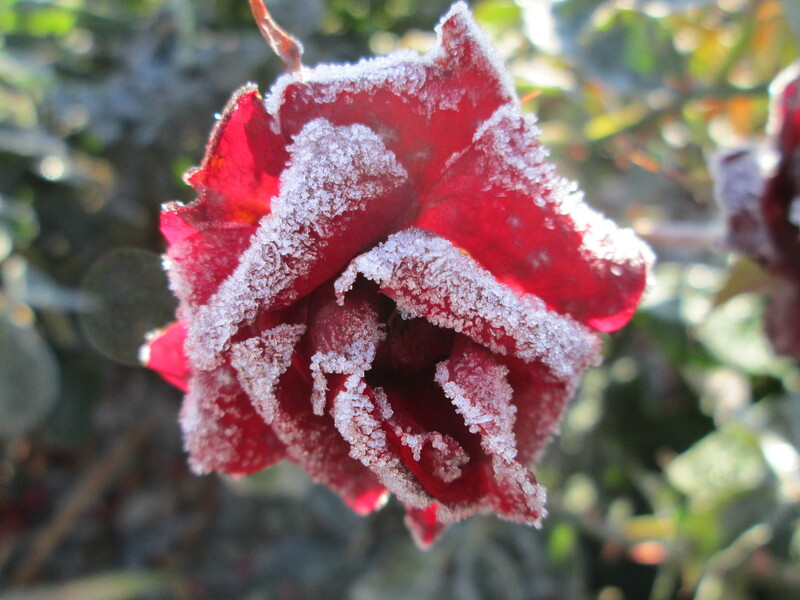 When my eyes lowered to meet the flower and plant beds I was captivated by the particles of frost that danced over the leaves and petals still holding onto their stems. 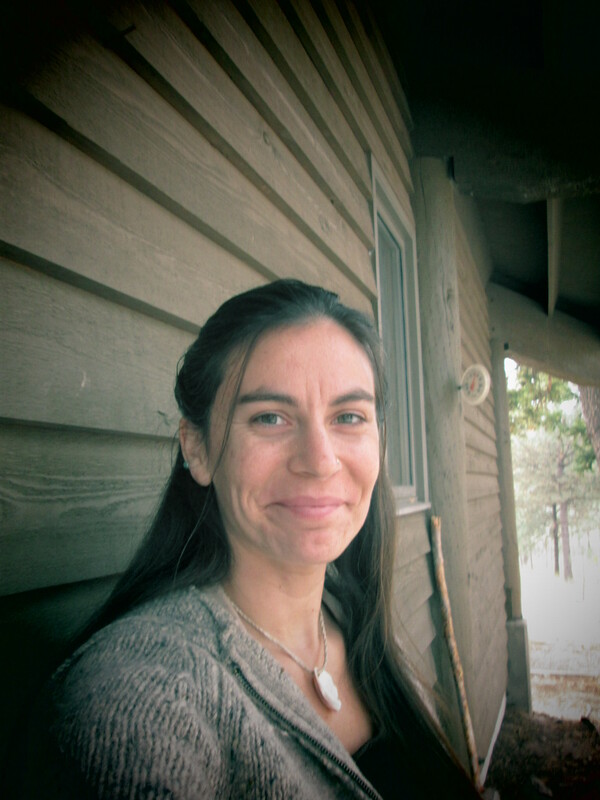 I just got back from the Open Way Sanghas fall retreat entitled: Wonderfully Together. 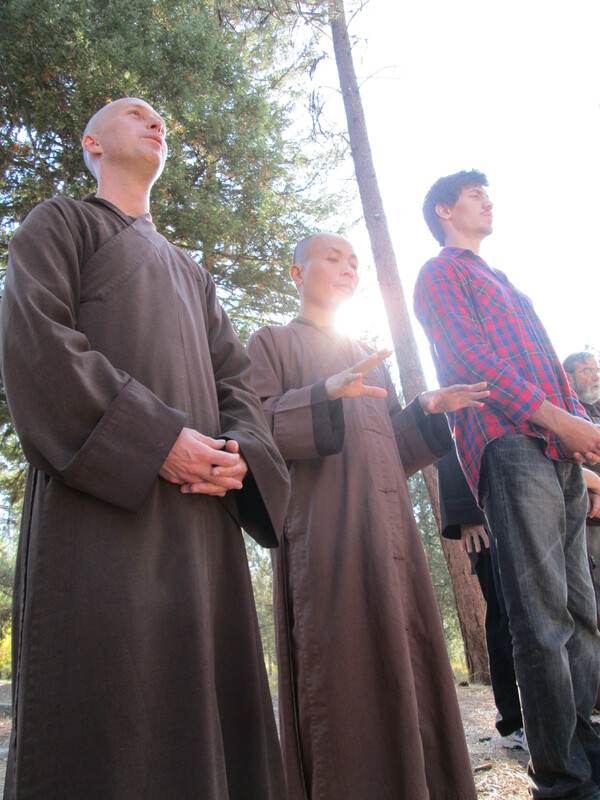 The retreat was held at the Lubrecht Forest Camp in Greenough, MT with dharma teacher Brother Phap Hai and Brother Phap Hanh, monks from Thich Nhat Hanh’s Deer Park Monastery in southern California. There were about 40 retreatants in attendance. We practiced sitting and walking meditation together, listened to dharma talks, ate our meals in silence, enjoyed free personal time and discussion groups in the afternoon and had evening programs after dinner. Our retreats start Thursday night and end on Sunday early afternoon and happen twice a year, one in the spring and one in the fall. Attending Open Way retreats has been a process of unfolding for me, much like everything in life is. I was trying to recall my first Open Way retreat many years ago but with my poor long term memory all I can really remember is being pretty uncomfortable and not feeling like I belonged – and getting annoyed a lot. I’m not entirely sure what made me continue attending them, maybe my love of this practice or the sense of belonging I felt on an deeper level. Whatever the case was I am sure glad I kept showing up. I’ve learned a lot about myself on retreats and each time I attend one I grow a little more comfortable with myself, and thus more comfortable with the retreat itself. The two are not separate. We have 3 deep roots: greed, ill will and delusion. Example – Greed: holding onto people, grasping, holding onto perceptions. Ill will: judging ourselves harshly, shutting down, judging others. Delusion: not seeing things as they are, seeing things as separate, seeing ourselves as separate. One root will be deeper than the other two for each of us. The mindfulness trainings will help us to work with these deep roots. The trainings are a gift and help us to care for ourselves and the world and help us to open up to the world around us. The practice of stopping in our daily lives is important. When we stop we can practice coming back to our senses. What are our reactions to what we see, hear, smell, taste, feel? What senses are more heightened? 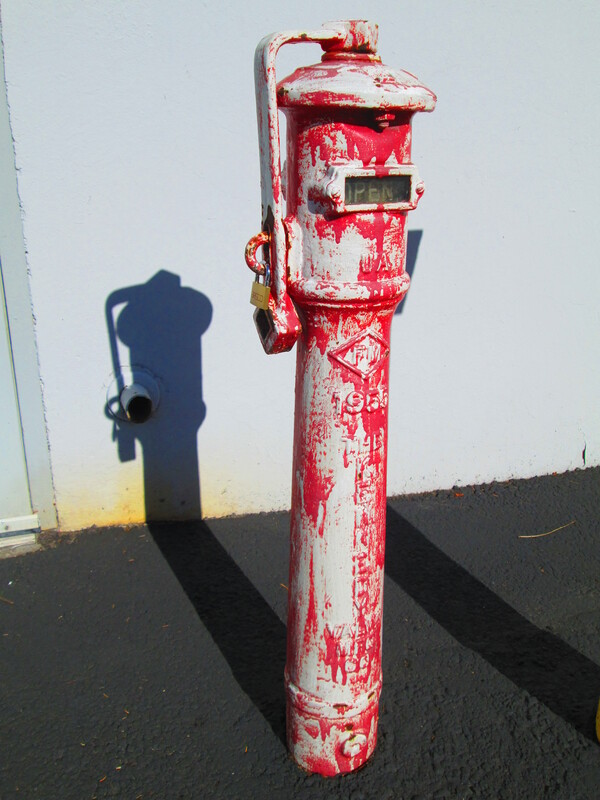 What are the first things we notice when we stop? Where does our attention go? Our everyday life and our spiritual life are not two, they are one, this is the heart of engaged buddhism. Seeings as where we had the retreat there were other staff people around who live and work there and other visiting folks to the university’s experimental forest camp location coming and going I found there to be a good number of distractions around during the retreat. 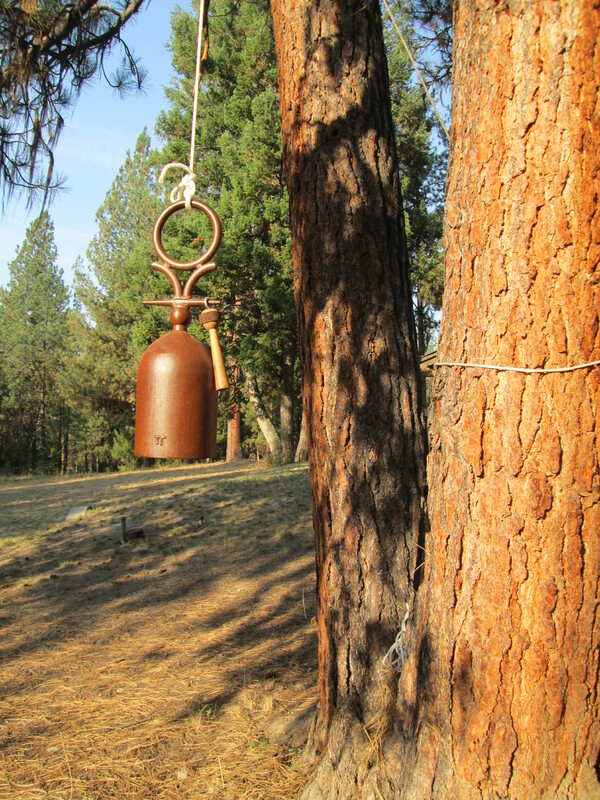 Our retreats are held mostly in silence so it doesn’t take much to create a distraction. For me one of my favorite parts about retreats is sharing silence with others so I missed it this time around. There was a certain lack of focus associated with it for me. I found myself concerned more about others practice and how the distractions were translating for the newer folks than for myself personally. Practicing amidst distractions is an advanced skill set. What I appreciated most about the retreat was the light heartedness of the monastics who led it. They moved with such grace and ease and had such humor and joy. I guess I expected them to be more formalized and solemn. It was nice to be reminded that the practice is alive and rich and diverse. It’s important to keep the practice fresh and light so that we continue breathing new life into it.